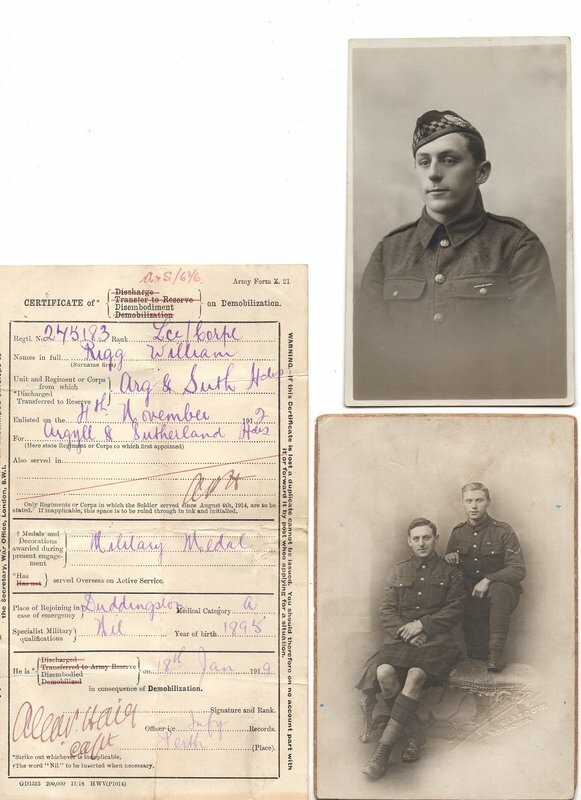 Both photo's have markings that say they were taken in Glasgow but I am wondering if it is possible that one was taken before he went to France and one after he returned and if the differences in the uniform might back up that theory. He served in the 1st / 7th Battalion of the Argyll and Sutherland Highlanders and was born in Kilsyth. He was a coal miner and survived the war. Hi, yes on the photo of the two Gents, the two men would appear to have their MM ribbons sewn on their unit, you can also make out his LCpl stripes, and what appears to be formation (Brigade or Divisional) patches on his upper sleeve. In the first photo the object in the breast pocket is the crossbar of a watch chain or strap, nothing to do with uniform. in the previous answer I think the word unit should be uniform. You are correct... Bloomin autocorrect...! Can you tell us how much you know about him? 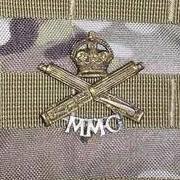 Have you got a service record, do you know when he earned his MM, do you know his original Army number was 1678? My Gt Uncle was also from Kilsyth and served with the 1/7th A&SH. Andy in post #2 reckons they could be wearing an MM ribbon, but the photo is so blurred it could be the 1914-15 Star, maybe even both, I can read though the photographers stamp shows "Glasgow" so it almost certainly dates from 1919 when he was returned to Scotland for discharge. London Gazette for MM according to the MM Index Card is 11/12/18. War Office list of 25/7/15 states suffering from gas poisoning. With 7 A & SH at this time. First time to France 15/12/14 - when the 7th went. Ancestry have a few scraps of records under 1678 but don’t add any real info. War Office list of 25/7/15 states suffering from gas poisoning. Definitely 25th July Mark? It's just that on the 24th May the Bn came under a massive Gas attack their "CO Colonel Carden and 2i/c Major King were mortally wounded and 19 of the 24 Officers became casualties" the official history I have states and also "it bleached the sandbags, withered the grass, corroded the buttons on the men's tunics and jammed the mechanism of their rifles". A wounded list from the 25th would make sense. Thanks all of you for the comments. RoughDiamond you and I corresponded a number of years ago and you shared a lot of good information. I have two of Williams medals and some of his paperwork. Most precious of all, I have an engraved watch that was given to him from his hometown in recognition of his Military Merit medal. Perhaps more precious than all of that was that I met him when I was dating my wife in the 1970's. He shook my hand and told me he was a coal minor, "Toughest job there is". He also described being chlorine gassed, "Awful stuff". He lived a long life and was very proud of his orange trees, living close to the beach in Ventura, California. A tough classic Scotsman. His history will be a project of mine in the future, perhaps after I retire, and part of a trip to France to retrace his Battalion History. I did pick up a copy of the 7th Battalion Diary a few years back. I am visiting England this summer and hope to visit Bedford as a precursor of the future trip to France. I want to share one more set of pictures. 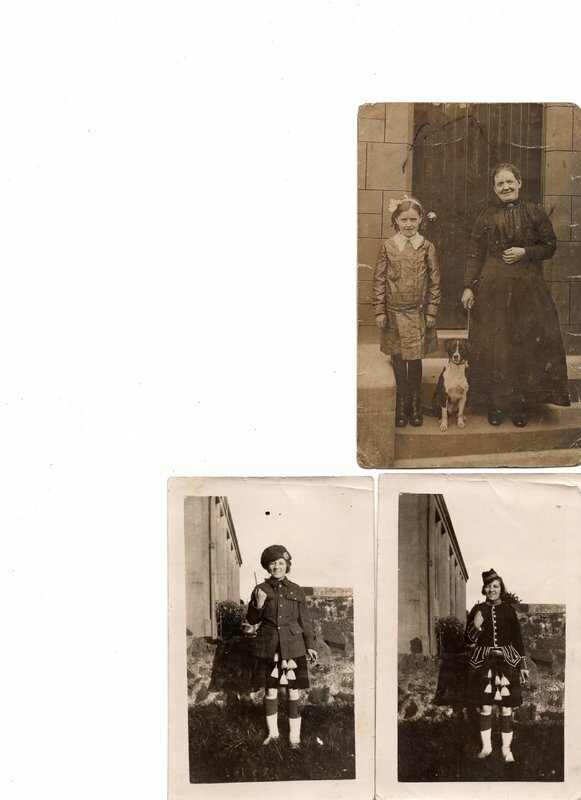 One is of his mother and on the back of the picture it notes that she is posing with the dog he brought back with him when he returned from France. There is a story there waiting to be told. The other two are of his sister, who hammed it up by putting on his dress uniform to pose for a few pictures in 1922. Not sure if these tell any more stories, but what you all have shared so far has been very valuable to me. His MM is recorded in the WD of the A&QMG 51 Highland Division. Routine Order 1071 dated 21/08/1918 by Brigadier General Oldfield has a long list of Awards "For gallantry between 20/07/1918 and 30/07/1918". 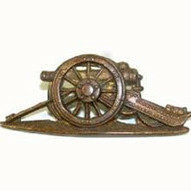 He is mentioned in the (Stirlingshire) Bn A&SH TF as L/Cpl 257183 W Rigg. He must have been gassed on a separate earlier occasion. It took four to six weeks to get into the Official Lists and about two to make the local papers if the family sent the details. On Ancestry in War Diaries F&F go to the Browse Box - Divisional HQ General Staff - 51 Div - Piece 2849/1-4. Page 530/705. EDIT: More info re May and July in the WD of 154 Infantry Brigade. Map showing Bn positions in May i.e. B 15 a 2 4 on p 467/759. One comment that seems not to have been noted: he looks like a pre-war Territorial. Not just from his date of entry to Theatre (he could have joined on the outbreak of war and still have gone with the battalion), but his sister is wearing a doublet which I assume he would not have received had he been a wartime enlistment. Sorry if that's been noted elsewhere but it didn't seem to crop up in this thread. So are the sources that you guys chase for this kind of information.....is it all Ancestry.Com or multiple different portals? Eventually I would like to do these kinds of searches myself. Ideally I would like to trace Williams pathway through the war and visit sites as part of learning more about him and the Great War. Plus of course each other. The great thing about the GWF is there are specialists in just about every aspect of WW1 you can think of. So the collective knowledge will often produce a result that individually we would not be able to. We all learn constantly from each other. As all his time appears to be with the 7th A&SH their War Diaries is obviously the place to go to find what they were up to and where they went. Higher level Brigade and Division War Diaries may also provide greater context. Thanks Mark, fascinating stuff. Appreciate the help. I has wrongly assumed that he was gassed in 1918 but I see that it was 1915. There are reports in the Unit WD about the gas attack on 24/05/1915 and a list of gas casualties under 9 Bn A&SH. According to the folder cover in the WD 7 Bn absorbed 9 Bn in May and they operated as a composite Bn until July when 9 Bn resumed. On FMP there are two hospital admissions for him in MH 106 for 1915. I will check them tomorrow at the library. His award of the MM is noted in the Daily Record of 21/12/1918. Also there are two mentions (Kirkintilloch Gazette and Kilsyth Chronicle) of him being presented the gold watch back in Kilsyth (along with other MM winners ) in February 1919. 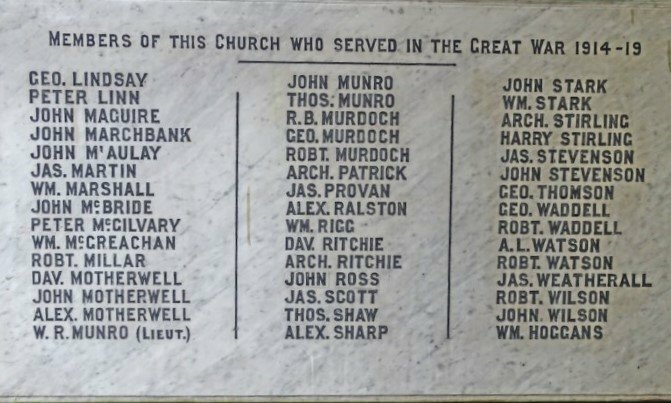 He appears in casualty list in Dundee Courier 11th August 1915. Noted as suffering from Gas poisoning. 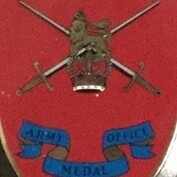 At that time rank given as Private, and under his original TF service number. Also he is listed on the plaques in the Anderson Church for those who served. The second photo most likely when he got back - dating it to December 1918 - January 1919 when he disembodied. The single medal ribbon is either his MM or his 1915 Star which was awarded from December 1918 well before he would have his received his British War Medal and Victory Medal. Any Idea who the other lad is? I have been wondering about that as well. Want to dig thru later family photos to see if he is a friend that shows up in other family pictures. He looks a bit like the other gentleman in the newspaper clipping. Yes. Anderson Church is in the middle of the town. The plaques inside have the names of all those from the congregation who served and also two plaques of those who died. My Grandfather and two great uncles are listed just above him - for sure they would have known him. 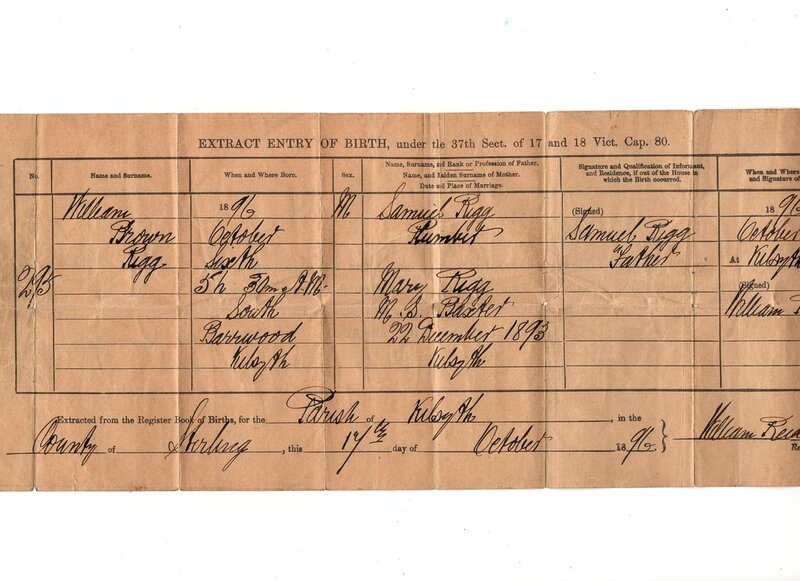 I had a look on his 1911 Census return - he was 14 and already a colliery labourer (above ground). He and his sister Annie are the only two Riggs in the town and listed as step son and step daughter to a James Anderson (coal miner) and Mary Anderson. His mother had re married and he had a younger half brother and sister (Andersons) - all born in Kilsyth. His father was Samuel Rigg - had been a plumber who died in Glasgow in 1898. Going by this I don't see a "fighting age" brother but maybe one of the Andersons or Baxters (his mother's original maiden name), or perhaps a friend, or one of the other MM winners in the newspaper list. Date of admission 26/05/1915. Details shown as 7 A&S Hdrs (T) B Co - 1678 Regg Wm - Age 19 - Service 2 years - months with Field Force 5 - Reason for admission Bronchitis, effects of gas slt. Moved to Etaples conv camp 13/06/1915. The other record in MH 106/1198 is the index book for the same hospital and cross references the admission serial number. MH 106/1081 has 25 gas related admissions for men fron 7 and 9 Bns A&SH dated 25/05/1915 and a further 8 on 26/05/1915. Each entry records the Company of the Bn. I will try and find them on the casualty lists in the WD. Here is his 1911 census return. Showing his mother, step father, sister Annie and younger half brother and sister at 2 Register Road. In those days there were coal pits right in the town. The two Baxters on the return are relations of his mother (probably her widowed father). You may like to join the Old Kilsyth Pictures group on Facebook. https://www.facebook.com/groups/139207229580851/ and post your photos there. As there is a lot of interest and quite a few WW1 era photos including quite a few 1/7th A&SH.